Tag line: "Never has the screen thrust so deeply into the guts of war!" 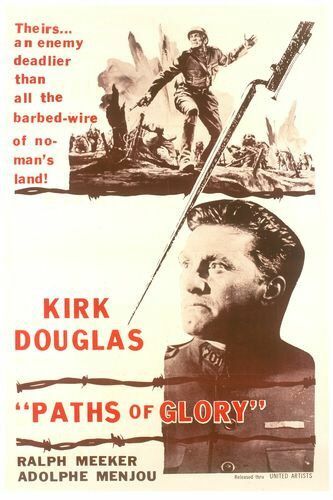 Paths of Glory is the best anti-war film ever made. By exploring the sharp contrast between the men who plan the battles and those asked to die in them, director Stanley Kubrick drives home the point that, while war may be hell for some, it's merely an inconvenience for others. France, 1916. French General Paul Mireau (George MacReady) has just received orders from his superior, General Broulard (Adolphe Menjou), to advance on a heavily fortified German position known as the Ant Hill. Though his men are battle-weary, Gen Mireau accepts the mission, and assigns his second in command, Col. Dax (Kirk Douglas), to lead the charge. The ensuing battle is a disaster. What's more, many troops remain in their own trenches, unable to join the fracas due to intense enemy fire. In a fit of anger, Mireau calls the soldiers who stayed behind cowards, and issues an order by which three men, chosen at random, will represent the entire battalion before a military tribunal. These three will then stand trial on charges of mutiny and cowardice, the penalty for which is death by firing squad. Col. Dax is appalled at the very notion of shooting his own men, and volunteers to act as counsel for the defense. With the odds against him, Col. Dax fights diligently for acquittal, understanding full well the lives of three innocent soldiers hang in the balance. In General Paul Mireau, Paths of Glory has given us one of the most loathsome characters in the long history of war films. Mireau’s thirst for personal glory is obvious; he accepts the impossible mission only after Brousard all but promises him a promotion for doing so. He's also out of touch with his troops, having spent the majority of the war miles from the front lines. As his men struggle to survive the daily bombardments that shake their mud-lined trenches, Mireau is holed up in a French villa, complete with imported rugs and the finest wines. This disparity is clearly defined in the scene where, on the eve of the doomed battle, Mireau makes a tour of the trenches. Marching straight ahead, like a peacock proudly displaying his feathers, his forward progress is temporarily broken when he addresses a weary soldier (Fred Bell) suffering from shell shock. In a move that would have made General Patton proud, Mireau slaps the soldier and orders him sent away in disgrace. Contrasting this sequence is the actual battle, when the camera focuses on Col. Dax as he personally leads the charge on the Ant Hill. We follow Dax across the battlefield in much the same way we followed the General on his “tour”. However, unlike Mireau, Dax must climb over the bodies of his men in order to maintain his forward progress. Throughout Paths of Glory, Kubrick paints an unflattering picture of military leaders, who position their soldiers on the field of battle as if they were pawns on a chess board, knowing full well that, to achieve final victory, the majority of these "pieces" will have to be sacrificed. To Gen. Mireau's dismay, his troops weren't the mindless pawns he hoped them to be, and, though prepared to die for their country, were not quite ready to lay down their lives for the king. I just picked up a used copy of this but haven't watched it yet. Now I'm more intrigued. Yes, definitely check this movie out. You won't be disappointed. An amazing movie for sure - and definitely in the same league as All Quiet on the Western Front (1930) as one of the best anti-war movies of all time. Klaus: Thanks for stopping by! Yeah, there's this film and ALL QUIET as the 2 best Anti-War movies. I'm not even sure what would be #3! In retrospect it seems a tad heavy-handed in its message these days, but it's one of the movies I saw as a kid that made me understand that I would never be a soldier. And I never was.